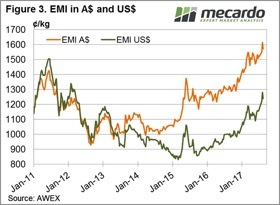 In a week of “smoke & mirrors”, the market reflected a similar image to last week and absorbed a large offering of wool in all centres with 39,000 bales cleared. It was the finer than 19 MPG this week that disappointed with all other categories posting gains. The EMI fell only 2 cents in A$ terms to settle at 1,556 cents, while in US$ terms the market improved 12 cents over the week (figure 1). The WMI was 9 cents lower than the previous close of last week. Merino skirtings started slowly but picked up over the week to finish strongly; it was a similar story for X Bred types while Cardings, including lambs, locks and crutchings, were solid early and stronger by the week’s end. This week was a pretty good result considering a larger offering and a higher A$ could have pushed the market lower following the last couple of weeks of price corrections. It wasn’t the case however, and growers responded by clearing the large offering and only passing in 5.2%. 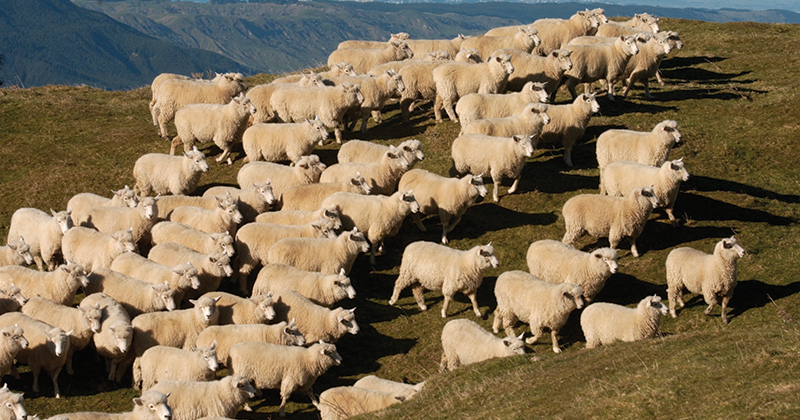 In fact, AWEX reported that on Wednesday Melbourne offered the largest merino fleece offering in almost 12 months. Fremantle struggled on Thursday, with across the board price reductions predominately in the19.5 to 22.5 micron offering, although growers only passed in 5% indicating satisfaction with the market levels. In the Forward Market, the past couple of weeks have seen growers take up good forward prices out as far as February 2018. This would seem a reasonable approach given the strong current market and the somewhat uncertain global circumstances. 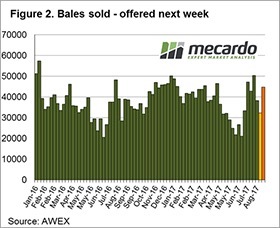 Through the looking glass into next week, another large offering of 44,281 bales are rostered for sale in all three selling centres (Figure 2). The solid performance this week in the face of a large offering and stronger A$ bodes well for next week.